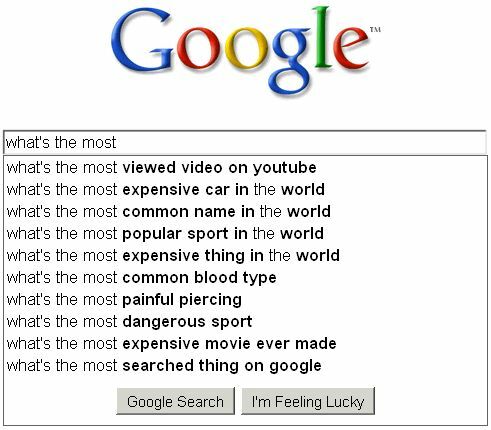 Google Game: What’s the most…? I was a little surprised to see that “most painful piercing” made it into this top ten. OK, well maybe not that surprised. But anyway, I’m going to let that query go unanswered for now (feel free to search for yourselves) and focus first on the most-viewed YouTube video. Can you guess what it is? Take a moment or two to come up with your selection then follow me over the jump for the answer. A couple videos to warm the cockles of your cold and tired heart. Maybe even the rest of it, too. First, a story of nurturing, separation, and the enduring power of love. And of shopping for wildlife at a department store. Money can buy you love: Lion Love. For something a little less involved/narrative-based, put your eyes on Keepon, the hugably cute dancing robot that made a splash on the YouTube back in 2007 and was subsequently co-opted by researchers who use it to study autism and other important stuff. But its research value aside, and whether or not you’ve seen it before, it can’t fail to light up your day just a little. For a new twist I suggest you have a friend G-Chat you the link so that you can have the video run mini-sized in the corner while you trudge through your inbox. NB: The song is great, but Keepon’s squishy moves work their magic even with the volume off. And of course, I can always rely on the E Trade Baby. Holy smokes, these get me every freakin’ time.